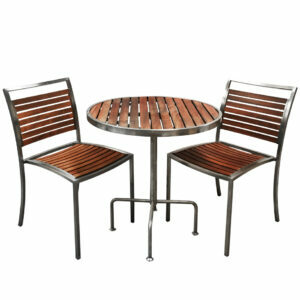 Rent a 3 piece table and chairs, outdoor furniture Plantation setting. This isan ideal rental solution for your bedroom balcony or compact terrace/outdoor space. This setting combines timber and stainless steel construction and features 2 matching chairs with a round, 70cm diameter pedestal table.